On June 23, 2010, the Anderson County Board of Health passed Regulation 2010-01, a Regulation Related to Food Handler and Food Manager Training. 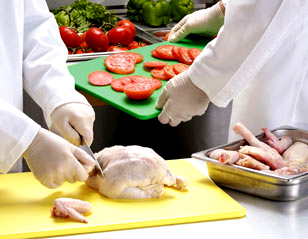 This regulations requires both food handlers and food managers to have a training to assist in prevention of foodborne illness. For more additional information, please call the Environmental office at (502) 839-4551 ext 1116. The Health Department protects the community from food borne illness by conducting Food Safety Inspections. All restaurants and grocery stores are required to maintain a permit through the Anderson County Health Department. Inspections are conducted at least twice a year on each facility. a Regulation Related to Food Service Inspection Results Placard. This regulation requires posting of an inspection results placard (A, B or C) at the time of each regular food service establishment inspection. Health Department environmentalists also issue permits and inspect temporary food vendors that sell food at fairs and festivals. A one to three day permit is available for $25.00. A four to fourteen day permit is available for $30.00. If you are a food vendor or an event organizer, please contact our agency at least two weeks prior to your event. • Approves food permits for food establishments. • Conducts food service inspections. • Conducts food service training seminars. and other places that sell food to the public. • Conducts foodborne disease investigations.